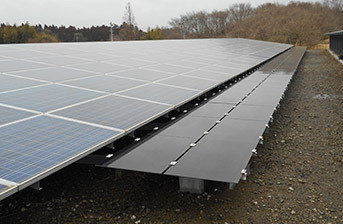 Ampt works with many of the industry’s leading inverter companies in different ways to lower the cost of solar energy. Ampt collaborates with inverter manufacturers to maximize project ROI for our shared customers. When upgrading inverters, Ampt optimizers allow the use of modern and lower cost per watt inverters rather than legacy inverters. Ampt enables your existing inverter to accept DC/AC ratios of 2:1 or more to maximize energy generation. 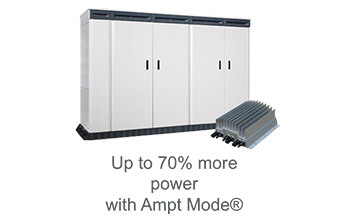 Ampt optimizers allow inverters to increase their rated output power and deliver a lower cost per watt. Provide a total solution to your customers that includes Ampt products. 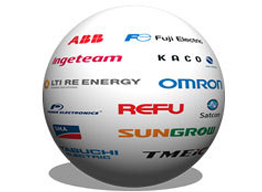 Ampt optimizers are deployed on PV systems around the globe with many of the industry’s leading inverter suppliers. We collaborate to ensure our mutual customers achieve the highest ROI with lower cost and higher performing PV systems. When upgrading legacy inverters, Ampt optimizers allow the use of modern inverters. 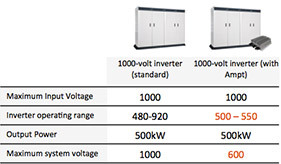 With Ampt, your 1000-volt inverters are set to operate at a constant or narrow voltage range that is less than 600V, but high enough to drive the rated output voltage and deliver full rated power. This provides a cost-effective solution for customers. This same adaptation can be done with 1500-volt inverters in 1000-volt systems. Ampt’s patented output voltage and current limits allow inverters to accept high DC/AC ratios without exceeding the inverter’s input current limit or infringing on other limitations. For many customers, this opens up significant value because they can achieve DC/AC ratios of 2-to-1 or more. Ampt optimizers allow inverters to operate in a narrow input voltage range that is closer to the maximum system voltage. This allows the inverter to deliver a higher AC output voltage at the same current which raises the rated output power of the inverter. Operating in Ampt Mode® unlocks system value to your customers and helps distinguish your inverters from the competition. Inverter manufacturers are including Ampt products in their solutions to deliver greater value to their customers. 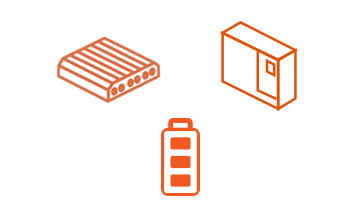 From low-cost DC-coupled storage to regulatory-compliant residential solutions, inverter companies are gaining the advantage by distinguishing their offerings with Ampt. Learn more about how Ampt partners with inverter manufacturers to better serve our mutual customers.